Life In A House of Blue ! : Genna and Russ, the Generous Kids! Home > press > Genna and Russ, the Generous Kids! Genna and Russ, the Generous Kids! Genna and Russ, the Generous Kids, were born out of a desire to make the world a more loving and caring place. Rather than simply accepting society's ills, Generous Kids was established to encourage the spirit of caring, giving and sharing in little ones ages three and up. By instilling these essential values at a young age, our children will grow up to be more empathetic, compassionate adults. Generous Kids is committed to making a positive difference in the lives of all children in need -- regardless of race, color, or creed. A portion of the profits fromevery item sold that carries the Generous Kids logo will benefit a children's charity. Genna & Russ, the Generous Kids, the two young goats from which the property is based, have been captured in an inspirational first-in-a-series book "Meet Genna & Russ, The Generous Kids" . The book with accompanying CD featuring six children's songs with titles such as "Giving Makes Your Heart Smile" and "It's Cool to Care" retails for $14.99 and can be purchased from the Generous Kids website at http://www.GennaRussKids.com. 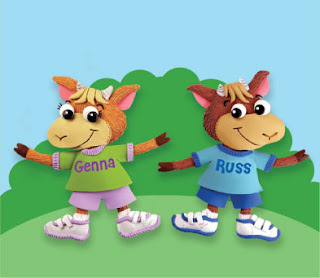 Also available are Genna and Russ plush animals that retail for $19.99 for the pair. Kids can role-play with the animals by identifying and experimenting with concepts of benevolence and virtuousness. Looks pretty cool plus it will teach kids values. I love that their names are Genna and Russ. LOL. Thanks for sharing. The concept is great. I definitely agree that it'll be really helpful for kids to learn more about caring to other people. We all know that the kids today will be the foundation of the future. What we teach them today will definitely reflect who they are as an adult. I agree w/the other reader. Great concept and something children need to be taught. Hubby is a teacher and it's so surprising that kids are no longer taught the basics in manners.